Tune into TV advertising and you'd think that most of the business world is running on Lexmark printers. 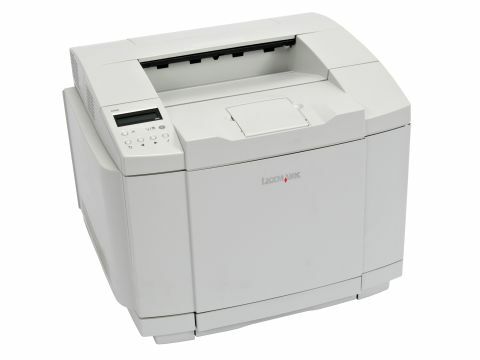 Unlike some of Lexmark's flimsier inkjet printers, the C500n has a real business-like feel to it with seemingly rock-solid build quality. It's a big, hefty beast, complete with heavy-duty 250-sheet paper input tray, which you can further boost to a 780-sheet capacity with the option of a secondary 530-sheet feeder. Due to its sheer bulk and weight, it would be natural to expect the C500n to have a carousel toner cartridge arrangement. However, a quick flip down of the front panel reveals a neat, inline stack of all four toner cartridges, which are easy to insert or replace without any fussy carousel rotation. Sadly, though, you might have to replace the toner cartridges sooner than you were hoping, because the starter cartridges have relatively low levels of toner. As well as the ubiquitous USB port, the Lexmark serves up an Ethernet connection as standard, which is impressive at the price. If you want to go wireless, Lexmark also offers an optional wireless 802.11g print server, but before you jump at the chance be advised that this costs about £220. That's considerably more than the printer itself. For such a businesslike printer, one thing that's lacking from the optional extras list is an automatic duplex unit so, like other printers in this price range, you're stuck with manual duplex at best. One popular pastime for laser printer users is generating high-quality colour prints on card as well as paper. These are ideal for using as jewel case inserts and the like. In our tests, however, the C500n completely failed to handle 160gsm laser-compatible card. It scraped large blocks and streaks of toner from the surface of the card on its way through the printer, producing nothing more than a nasty mess. Switching back to plain paper, the C500n fared much better, with high-quality mono and colour output. Marketed as a fast laser printer that can also handle colour printing when needed, it generated 31ppm mono output in draft mode, dropping down to a 18 second first page time for high-quality mono and a still respectable 24 seconds for colour documents. Colour photos took a little longer at 29 seconds. As usual, best cost-efficiency is to be had from using the high-yield black and colour cartridges. Yet even then the C500n is pricey for mono, with toner costs of 2p per page. Colour costs are surprisingly reasonable at 6p per page. The other drawback is that, unlike the Canon and HP printers, there's a separate imaging unit that needs replacing, even if this is only after about 120,000 mono prints (30,000 colour). As such, it lasts about three times as long as the imaging units in some rival printers. Even so, with an imaging unit price of £138, you might be better off buying a whole new printer.